The Green Line, a VR short film, will be screening at A. G. Leventis Gallery for the entirety of the month of April every Wednesday, Friday, Saturday and Sunday. Documenting areas within the Cyprus Buffer Zone, some unseen by the public since 1963, The Green Line immerses viewers into one of the most restricted areas on the planet. TheGreen Line team was granted access into the Cyprus Buffer Zone in January 2016. Escorted by UN convoy, the team filmed what remains of the abandoned villages of Selemani, Varisheia, and the abandoned Nicosia International Airport. 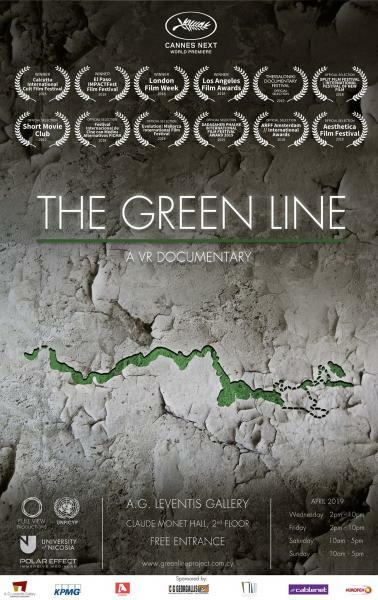 The Green Linemade its world premiere at the 2018 Cannes Film Festival, and since then has been officially selected for sixteen international film festivals, winning “Best VR Film” four times. The Green Line was produced by Full View Productions with the generous support of the University of Nicosia, Polar Effect Productions and UNFICYP. The University of Nicosia (Strategic Partners), the Department of Cultural Services (Main Sponsor), KPMG (Gold Sponsor), Cablenet (Sponsor), Areteo Hospital (Sponsor), Nurofen (Sponsor), Alpha Cyprus (Media and Communications Sponsor). For more information please visit new.greenlineproject.com.cy or contact us at info@greenlineproject.com.cy.